Joel's Jottings: Why We Should Pay Attention to Medical Thrillers. Why We Should Pay Attention to Medical Thrillers. It was in the novel Outbreak by Robin Cook, that I came across the word 'Ebola' for the first time. I read that book in 1990. But it was published in 1987, three years earlier. The Ebola virus itself was discovered in 1976, 10 years earlier. This morning, the total number of deaths from Ebola crossed 4000 since the start of the outbreak in this year 2014 alone. You can click here for the news on Al Jazeera. And the number of cases is growing at an alarming pace. In the old book I had read, a deadly outbreak of Ebola Virus in the United States is terrifying everyone. And there is the lovely Dr Marissa Blumenthal – Yes. Most of Cook's books have extremely smart female protagonists - who is assigned by CDC (Centers for Disease Control and Prevention) to investigate into the outbreak. Much to her shock, she finds out that only certain physicians, in certain health centers, are being affected by this un-treatable —and virulently contagious – rare, new disease. They find out that the virus came from Africa, from monkeys or gorillas. But as the plot thickens, we discover that there is danger to Marissa's life, there is FBI involved, and there is an unthinkable sabotage being planned by her colleague. So, the amazing medical thriller kept me on tenterhooks till the end - when I finally breathed a sigh of relief. I thoroughly enjoyed the book. Back then, 25 years ago, Ebola scare was mere fiction. The story gave us vicarious thrills. But today, it is real. It is horrible. It is growing. And it seems to be getting out of control, every day. And the count of the dead from this virus keeps increasing. 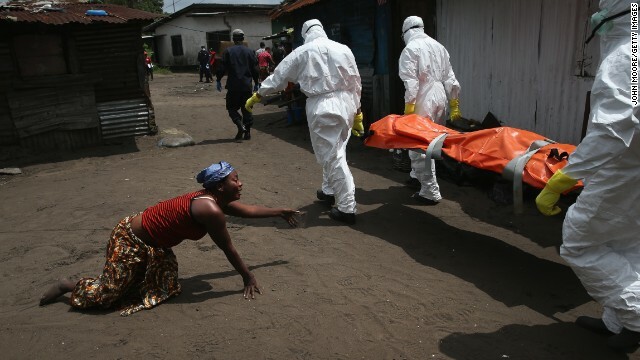 As of 5 Oct 2014, a total of 3,879 people out of 8,033 cases had died from this Ebola outbreak. But as of today, 11 Oct 2014, a total of 4000 died out of 8399 known cases! From the West African countries of Sierra Leone and Liberia, to the far-flung cities of Dallas in USA and Madrid in Spain, and now even with some suspected cases in Brazil too, the rise in the cases of Ebola has got the alarm bells ringing all over. As I write this, I am seeing TV news of a guy on a plane being offloaded by protective-suit-wearing-medical-officers for joking that he has Ebola. He was taken away, as if he said he had a bomb. While I lack medical knowledge to understand how and why Ebola is not being contained fast enough, I have read enough to know that Ebola is not something that just emerged suddenly from nowhere, now. If information on the virus was available for over 30 years now, why is it that the famous Centers for Disease Control did not come out with appropriate methods to contain the spread, if an outbreak occurs? Is it because governments do not allocate enough funds for serious research? Is it because people are complacent, believing that medical advancement we now have is good enough? Is it because we think these deadly diseases do not really matter to us individually? I believe these books, the medical thrillers, are very good sources of inspiration for research scientists to work in the right direction. And if we pay attention to them, they may help prevent large scale epidemics which, God forbid, can even grow into pandemics. Did not Jules Verne, the science-fiction writer, see men going to the moon, a century before man landed? Did he not describe an electric submarine long before submarines were even thought of? So why should the scientific centers not take medical thrillers seriously? I remember two other novels that I had read earlier by Robin Cook – Fever and Coma. Coma, we know became a Hollywood movie that won much acclaim. It had dealt with scandals in human-organ transplantation, when the idea of transplantations was still in its infancy. 'Fever’ was a book in which I head the word ‘Leukemia’ for the first time. Sadly, the cure for Leukemia is still evasive, like it was some 25-30 years ago. And the novel Fever, by the way, became the main inspiration for a Telugu novel originally serialized in a weekly magazine, ఆంద్ర భూమి (Andhra Bhoomi), with the Telugu title ప్రార్థన (Praarthanaa). The writer was యండమూరి వీరేంద్రనాథ్ (Yandamoori Veerendranath). You can find more info in Telugu by clicking here. I followed the serial in Telugu, after I had read the original English novel. But it told the then less-informed world, the horrors of Leukemia. I believe these medical books by Robin Cook, Micheal Crichton (The Terminal Man, for example) and other authors -- just like science fiction by Isaac Asimov, Arthur C Clarke and Ray Bradbury which inspired robotic technology, artificial intelligence and interstellar missions --- must spearhead greater research in the field of medicine. I just hope the Ebola virus will be contained and treated quickly. We are not living in the days of the Black Death! The boasting of knowledge and technology we possess is of no use if we don't act on it!